Since getting the keys to the cabin in Tahoe—a few months ago now—we’ve been spending a lot of weekends in the mountains! We were lucky to get to go up right away, as everything was pretty much move-in ready, but we still have a wish-list and we’re slowly ticking things off. One of the first priorities was to make the bedroom feel comfortable: new bed, new mattress (courtesy of Leesa), and some crisp, fresh sheets. 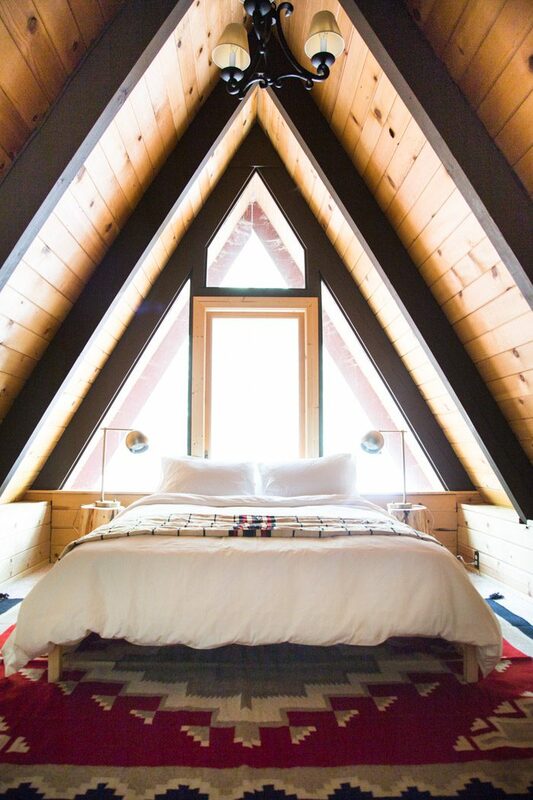 There are two bedrooms upstairs in the apex of the A-Frame. For this, the one in back, I knew I wanted to flip the bed to go against the window, so it was important to me to keep the bed low (in other words, ditch the box spring). I also wanted to add rugs to both rooms. 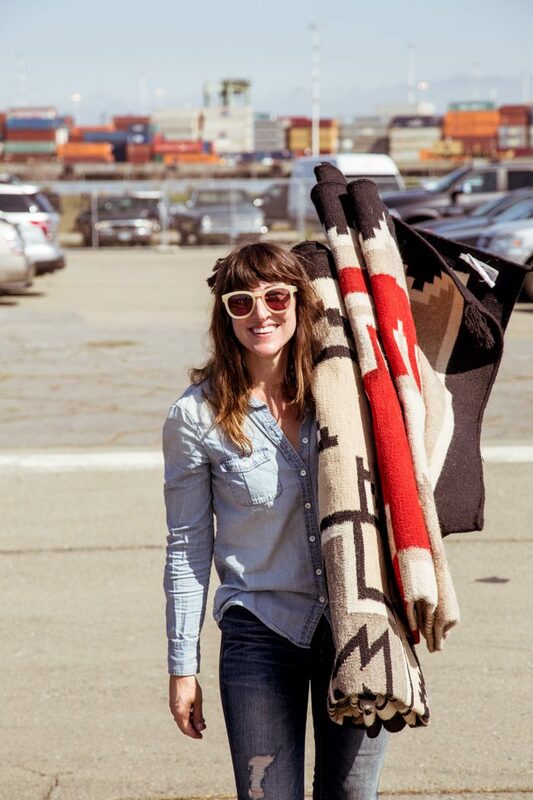 Our first stop was at the Alameda flea and I found some low-pile rugs that were reminiscent of Navajo. For the frames in both rooms, we chose a simple wood one from Ikea. 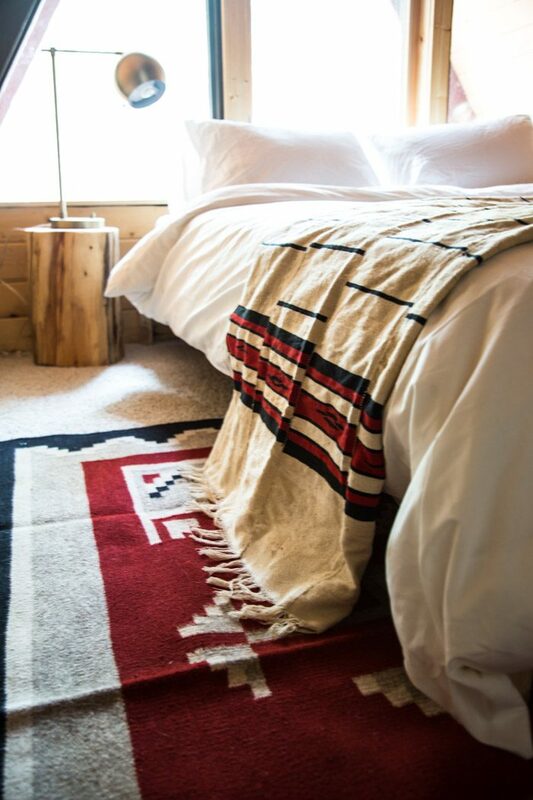 I took the headboard pieces to a lumberyard in Tahoe City, and asked them to make a few clean cuts to keep everything one level (below the mattress). This was especially helpful for the other bedroom, so we could push the frame up against the sloped walls as much as possible. As is frequently the case, the assembly took about twice as long as expected (despite all of Hudson’s help). We got the wrong slats, forgot the middle beam, made a couple of return trips to the big store, and then realized we couldn’t get the box spring down from the second floor without breaking it down. Isn’t that always the way? Aron actually ended up coming back one night by himself to finish the assembly. By comparison, getting the mattress up there was a piece of cake! Leesa had offered to send us one of their luxury mattresses, and it couldn’t have come at a better time. It arrived on our doorstep, compressed in a box the size of a mini-fridge, and we were able to drive it up ourselves. The box is heavy, but the two of us carried it upstairs without issue, and in seconds it seemed to magically grow into a 10-inch-mattress. We had no idea how key that compression would be when we made the order. 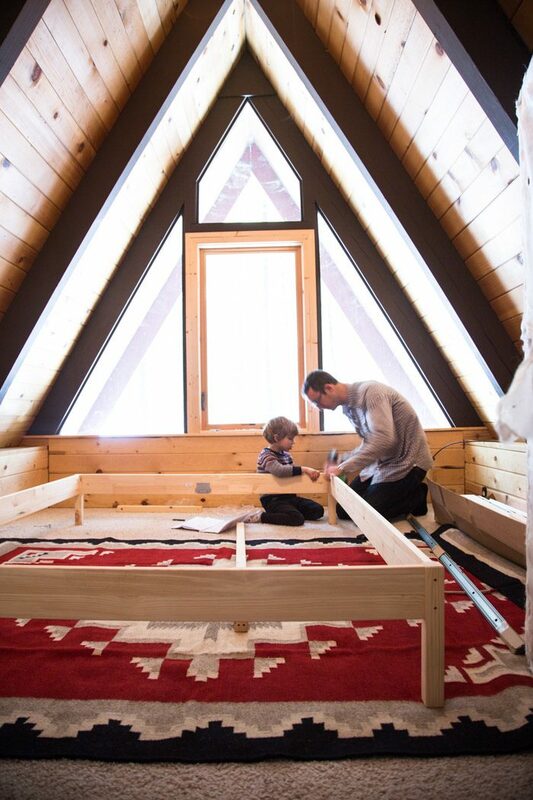 And there are now multiple reasons we’re thankful it doesn’t require a box spring! I can’t overstate how much better it feels than the bed we had inherited with the cabin. We had been waking up with backaches! With the new Leesa mattress, there are 2 inches of memory foam (no more rolling toward the middle), and the bed feels comfortably firm. 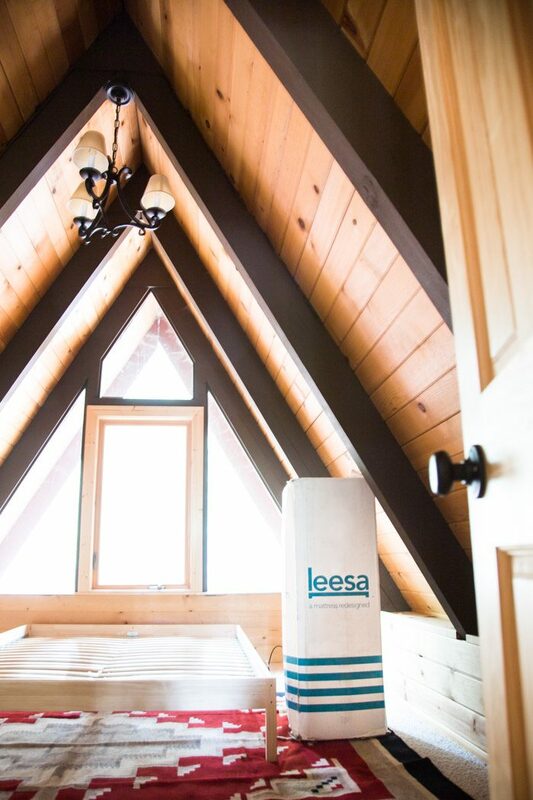 If anyone is considering a new mattress, Leesa is offering $75 off to the first 20 readers to redeem promo code HT75 at checkout. For finishing touches, I added white sheets, a vintage blanket (also found at Alameda), and a set of bedside lamps (which I actually swapped for the black ones). We also want to replace the overhead light fixture with a globe pendant (like this) and we found some tree-stump side tables (like these). It’s really starting to feel like ours! P.S. Decorating on a budget. 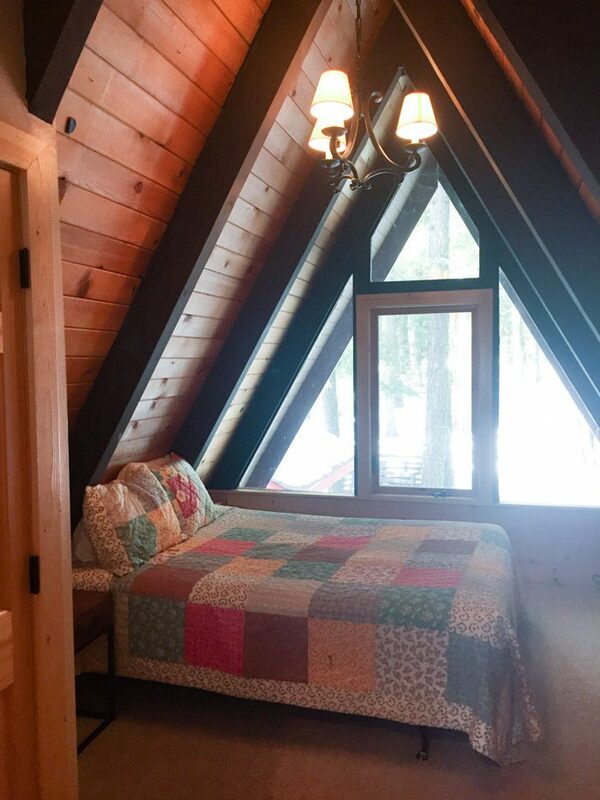 And more cabin photos on Instagram: #TwoPinesTahoe. © 2005 - 2018 Ashley Muir Bruhn / Hither & Thither. All rights reserved.